Today I'm going to talk a bit about some of the math behind the warp speed changes coming with Rubicon (and I'm going to do it using graphs, which are vital to any good dev blog!) With the Rubicon expansion, there are going to be noticeable changes to your ship's mobility as you warp around New Eden. For a long time, the options available for us to balance how ships warp around have been rather limited. The only really variable we could tune was the top speed. However, as I'll show later, changing this value only has a minor impact on the overall travel time of fast ships vs slow ships. Now that the ship rebalancing train has reached the Interceptor class - ships whose defining characteristic should be their ability to quickly get on top of a target - it was time to take the opportunity to do something about this. With these changes, we should see a more meaningful role for fast tacklers and scouts to be able to snare targets for their larger (and slower) friends. Firstly, I want to make sure we're all aligned regarding what this does and does not cover. For the purpose of this blog, I'm talking about everything that happens in a warp AFTER your ship's velocity has reached the alignment threshold of 75% of its maximum speed, in a direction roughly oriented towards the destination. Before this point, your ship is simply aligning, not warping. Nothing we're changing in Rubicon affects this alignment phase, only what happens after you see the warp kick in. During the Acceleration Phase (as the name implies) your ship's speed is increasing, up to its maximum warp speed (measured in AU/s). Once the ship has reached maximum warp, it will spend a period of time in the Cruise Phase. Here, it will cruise at its maximum speed, until it is time to begin decelerating. The Deceleration Phase is mostly the opposite of the Acceleration Phase - The ship is slowing down from its cruise speed until it drops below its sub-warp maximum velocity. At this point, the ship exits warp, and everything returns to normal. 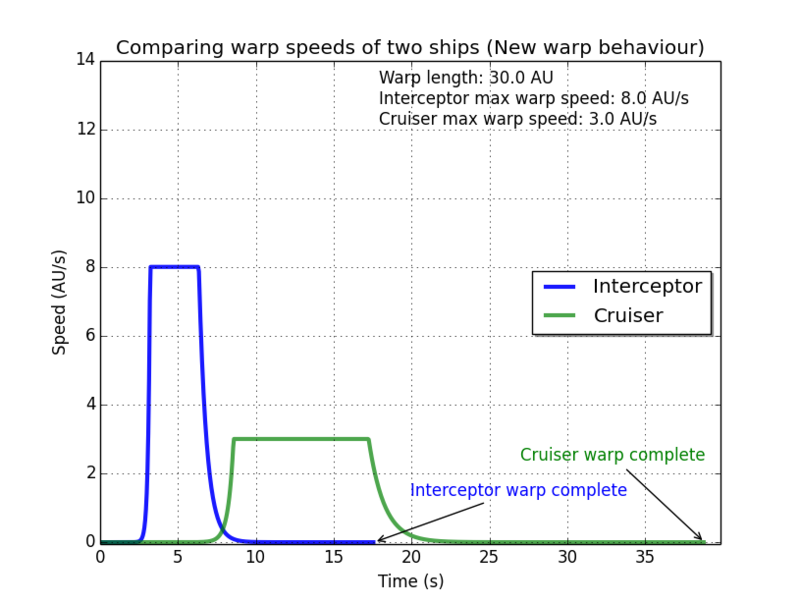 This graph shows the three phases for a cruiser hull performing a 30 AU warp. Acceleration takes almost 9 seconds, it then spends another 9 seconds cruising at 3 AU/s. Finally it spends nearly 22 seconds decelerating. All ships follow the same pattern, but with higher or lower top speeds according to their class. where x is the distance travelled (in metres) at time t (seconds), v is the speed (m/s) at time t, and k is a constant (sort of - see later). For the deceleration phase, the equations are similar, but with a negative time coefficient (and an offset to handle the time/distance elapsed during acceleration and cruise). So, what value does k have in these equations? For most warps, faster ships should be noticeably quicker at covering distances than slower ships, so that we can have meaningful differences between ship class mobility. Remember that constant k I mentioned earlier? Well here's how we've changed things. For any ship, k is now a function of that ship's maximum warp speed. This means that ships that have a higher speed will reach that speed sooner than a slower ship reaches its own (lower) top speed. 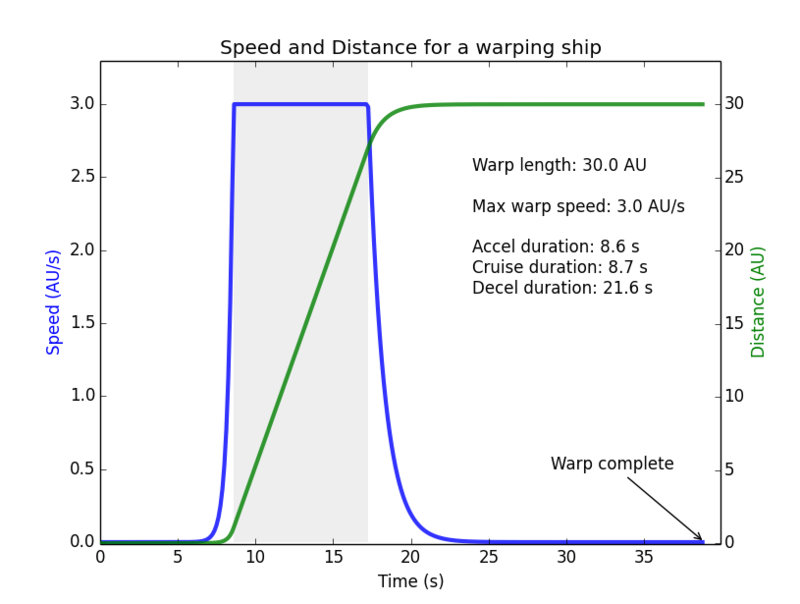 For the acceleration phase, k is equal to the ship’s maximum warp speed (in AU/s). For the deceleration phase, k is equal to the ship’s maximum warp speed (in AU/s) divided by 3, but with a maximum value of 2. This maximum is in place to prevent ships with excessively high warp speeds from decelerating out of warp so quickly that they transition from "in warp, many AU away" to "next to your battleship and firing up tackle" in less time than the server, client and player can reasonably handle. 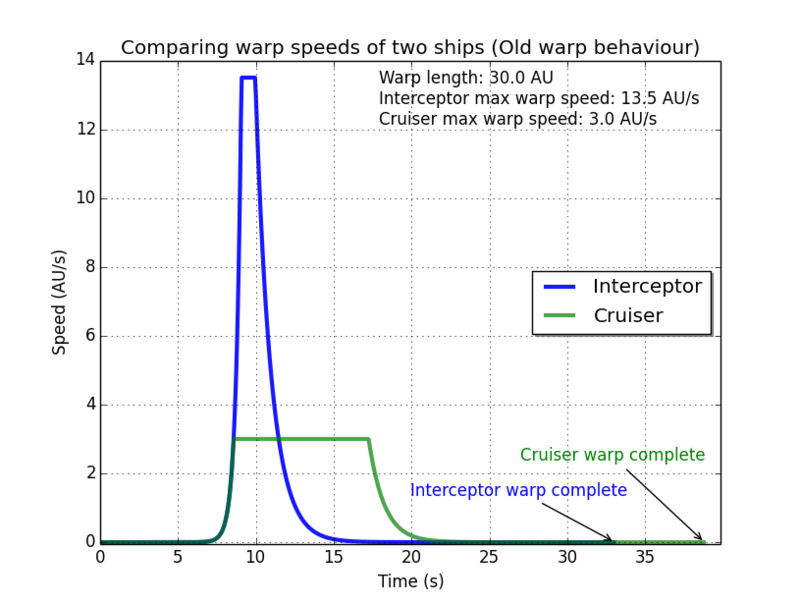 Observe that even though the interceptor's maximum warp speed has been reduced from 13.5 AU/s to 8 AU/s, it still manages to beat the cruiser to the finish line in less than half the time. Fleet warps will continue to work in the same way as before - all ships will use the warp profile of the slowest ship, so remember to Stay Aligned and you will arrive together! Similarly, acceleration gates will slingshot your ship using the same warp acceleration as a manual warp. These changes are already on the Singularity test server, if you're keen to try and see how they feel. I hope you found this interesting, and that you enjoy everything coming in Rubicon. Last one to that stargate buys the first round! New to EVE? Start your 14-day free trial today. Returning pilot? Visit Account Management for the latest offers and promotions.